Releasing the Magic! : TEAMWORK MATTERS.. PASS IT ON! TEAMWORK MATTERS.. PASS IT ON! We know what works, from the Sutton Trust and EEF toolkits, EPPI studies, John Hattie, Michael Fullan and Andy Hargreaves, and importantly we know what doesn’t work! 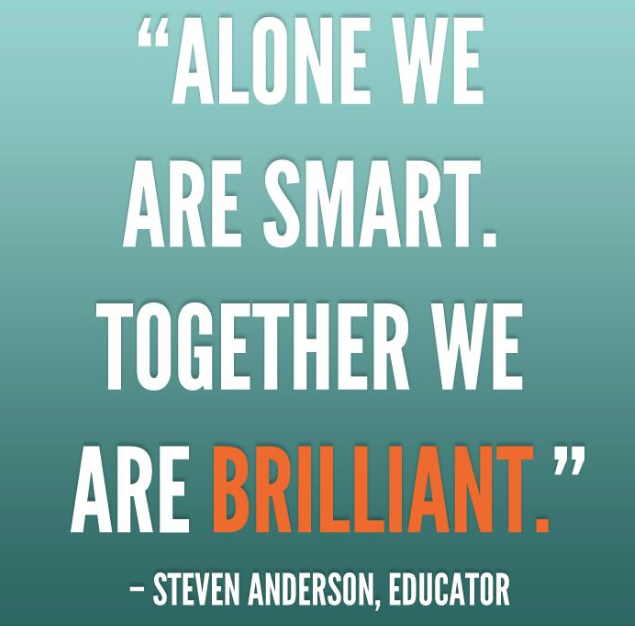 We must remember that teaching and learning is a team game and to develop world class learning critically depends on sharing, networking and collaboration. We must stop chasing accountability and focus instead on impact and outcomes. We must remember that all colleagues, and not just teachers, are part of the team. We must stop trying to do everything and systematically focus on the things that matter. We must learn that courses and events are wonderful opportunities to share and celebrate, but do not improve practice. Feedback, reflection and coaching over a sustained and focused approach do! Interestingly primary school colleagues have always recognised that professional development is more effective when the schools approach is not through one off, episodic and fragmented workshop sessions but rather as a sustained, coherent and intense part of a whole school approach linking curriculum, assessment, standards and professional learning around a theme that the school wants to address. Research suggests that collaborative approaches that develop communities of practice to promote whole school development that extends beyond individual classrooms have the greatest impact on standards and outcomes. This approach also provides a framework for reflection and feedback, allowing teachers to raise issues, take risks and address their own practice. Although time is not the only variable that matters, it is a prerequisite for effective learning. Research has shown that the teachers that who engage in high quality, sustained and intensive professional development go on to produce significant improvements in student achievement. Research I have read, and re-read recently, shows that professional development lasting 14 or fewer hours showed no effect on student learning while programme offering more than 14 hours of sustained teacher learning opportunities showed positive effects. The largest effects were found for programmes offering between 30 and 100 hours spread out over 6-12 months. Experience from the best schools I know and the research suggest that teachers need to experience sustained, job-embedded, collaborative teacher learning strategies through the development of professional learning communities. Communities where, teachers work together and engage in reflection and dialogue to examine their practice and student performance and to develop and implement more effective teaching and learning practices. Communities where, teachers have opportunities to work together, to learn together, to network, try out and reflect on new practices and share their individual knowledge and expertise. More than anything else, feedback helps us improve and develop. So, please let me know what you think? I AM ON TWITTER AND LINKEDIN! Those colleagues who want to follow me on twitter or LinkedIn, you can find me as chrisedwardsesq! See you there! READING IS THE KEY TO LEARNING!! THIS GOOD FRIDAY REMEMBER THE THINGS THAT MATTER: FAITH, FAMILY AND FRIENDS! ALWAYS FOCUS ON BELIEFS, VALUES, ATTITUDES AND BEHAVIOURS! GRIT = PERSEVERANCE + PASSION! Grit is a positive trait that involves perseverance of effort to accomplish a long term goal no matter what challenges lie in the way. "There is no passion to be found playing small -in settling for a life that is less than you are capable of living." "It always seems impossible until it is done." "Life isn't measured by the number of breaths we take but the moments that take our breath away." "Those who bring sunshine into the lives of others, cannot keep it from themselves." "Everybody can be great... because anybody can serve." "Only a life lived for others is a life worthwhile." "No fine work can be done without concentration and self-sacrifice and toil and doubt." "If I were to wish for anything, I should not wish for wealth and power, but for the passionate sense of the potential. For the eye which, ever young and ardent, sees the possible!" "If you are called to be a street sweeper, you should sweep streets even as Michelangelo painted, or Beethoven composed music, or Shakespeare wrote poetry." "The miracle, or the power, that elevates the few is to be found in their industry, application, and perseverance under the prompting of a brave, determined spirit." "The world cares very little about what a man or woman knows, it is what a man or woman is able to do that counts." "It's never too late to be who you might have been." "Twenty years from now you'll be more disappointed by the things that you didn't do than by the ones you did do." "Few will have the greatness to bend history itself; but each of us can work to change a small portion of events, and in the total of all those acts will be written the history of this generation." "There is nothing in life so difficult that it cannot be overcome. This faith can move mountains. It can change people. It can change the world." Over the last fifteen years I have worked in two contrasting authorities building the foundations for truly outstanding education and learning. I worked in York to establish the new unitary authority and then moved to Leeds to create Education Leeds which under my leadership has become an extraordinarily successful organisation; winning awards and recognition regionally, nationally and internationally. It is a unique public private partnership and as Chief Executive I have provided strong, dynamic and effective leadership and created a unique culture built on partnership, engagement, empowerment and trust. I am keen to ensure that I share the experience and expertise I have developed over the last fifteen years especially at a time where public companies and social enterprise models are developing to enhance and enrich public services. I would welcome the opportunity to discuss any opportunities that there might be working with you to use my experience of leadership development, cultural change and organisational development. We all need to be positive and to celebrate and shout about the great things colleagues are doing... no one else will! Let me know if I can help! TODAY IS GOING TO BE A GREAT DAY... PASS IT ON! WHY ARE WE HERE... PASS IT ON! QUICK FIXES DON'T WORK... PASS IT ON! SET THE WORLD ON FIRE... PASS IT ON! WHAT ALSO WORKS... PASS IT ON! WHAT DOESN'T WORK... PASS IT ON! WHAT WORKS... PASS IT ON! VISIBLE LEARNING... PASS IT ON! IT'S REMEMBRANCE SUNDAY... PASS IT ON! FEEDBACK MATTERS... PASS IT ON! WHERE DO THE WEEKS GO?